But what if you need to print only a part of your music catalog? The "Quick Filter" menu, where you can select albums by location, format, or by custom fields. Additionally, "wanted" and "for sale" albums can be displayed. The quick search field together with Group operations. 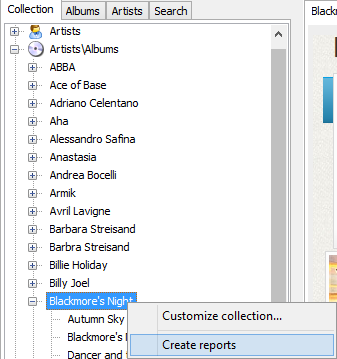 An example: select all albums of an artist. The "Search" tab. Here you can enter a number of parameters, find albums that match the conditions and create a report. The report will display only the results of your search. The letter filter on the toolbar. You can depress a letter to display all albums starting with the letter, then go to reports. It is also possible to select albums in the Group operations manually. Only selected albums will be exported to reports. The "Collection" tab. Here you can select any item and create a report for the item. The "Collection" tab. Here you can create many different sorting methods and apply any of the to Reports, as we have already described above. An example: print report by artist. There is a difference between this example and the one from the previous section: here, all albums of your collection sorted by artist will be displayed in the report, while in the previous section, only albums of a single artist were displayed. In the same way, you can apply any other sorting method. 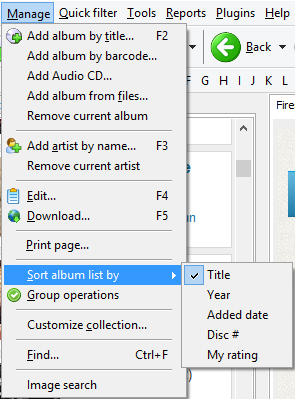 The main list of albums can be sorted using the "Manage" - "Sort album list by" menu item. On the "Search" tab, search results can be sorted according to the method selected in the "Sort by" field.